Did you know that we spotlight a different department every month? Click here for customizable tools and best practices to recognize all departments. 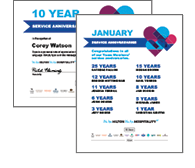 Milestone events, such as service anniversaries and birthdays, are important days for Team Members. You can show them that it’s an important day for you, too. 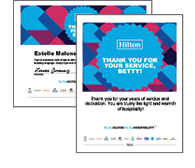 Choose from a variety of customizable recognition tools and best practices to recognize service anniversaries and birthdays, welcome new hires, and honor the retirement of a Team Member. All content is customizable, including language. Choose from certificates, flyers, and best practices. Cards and flyers to recognize birthdays and welcome new hires. Download a certificate and flyer, and view 50 tips for recognizing retirement.